The ski town of Cauterets, in France’s Hautes-Pyrenees department, has a lot to offer a family with mixed interests or varying skiing abilities. This historic town first became a tourist destination back in the 16th century when Queen Marguerite of Navarre visited with her court to take, and bathe in, the mineral-rich waters — said to be a cure for respiratory problems, throat and nose ailments and arthritic aches and pains. Tourism peaked during the Victorian era. Its legacy is the handsome buildings with balustrades and delicate metal balconies. Cauterets, the ski town, was developed in the 1960s but does not feel like a resort as it is lived in year round, giving it a charming, welcoming feeling. The famous healing waters (even today French doctors prescribe three week-long stays for their patients!) make a great skiing partner. At the end of a day’s skiing you can soak in the thermal waters in an impressive new spa, the Bains du Rocher. Les Bains have an indoor and outdoor pool, gymnasiums, a yoga room, massage rooms, a solarium, and steam rooms — in fact, everything to pamper a ski-worn body. A combination family ski/spa pass (called Aquaschuss) is available for 169 euros per person (based on 2 adults + 2 children). 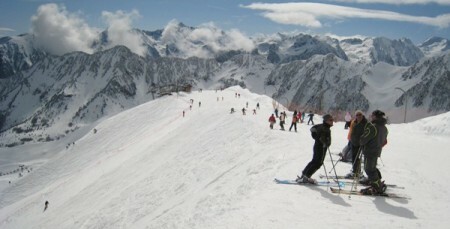 The pass gives you six full-day ski passes and five two-hour passes to the spa. Why is Cauterets a great ski destination for families? It has a little of everything so the whole family can do what they like without being miles apart. The Cirque du Lys ski field — an exciting 12-minute cable car ride up the mountain from the village — lies at an elevation between 2,450 and 8,000 feet, making it one of the highest Pyrenean resorts, and the first and last to have snow. There are 22 miles of downhill runs with four categories to suit different abilities, a freeboard area, guided snow-shoeing and a huge cross-country (or Nordic) skiing zone at the forested Pont d’Espagne. 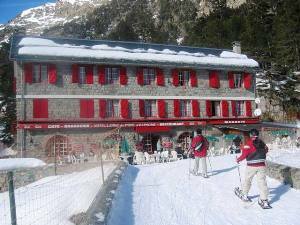 There are supervised crèches on the slopes, and the town has a number of vacation clubs where you can safely leave your children (from two months old) while you hit the black runs or take off for a day’s cross country through the forests of Pont d’Espagne. You and your children can sign up for lessons (in English) with the famous French Ski School (ESF) or chill out for a day or two exploring the town. Or go further afield to visit Lourdes castle and the famous Lourdes grotto (a 40-minute drive/taxi ride). A fun in-town activity is to watch candy being made in one of the town’s Berlingots stores. Berlingots date back to the 1800s when an enterprising doctor prescribed sugar to get rid of the lingering sulphur taste of the thermal waters. This gave birth to the Berlingots candy industry. Today this hard bon bon comes in several flavors and colors. You can watch them being made in Cauterets by Eric Lestable, who hails from a long line of Berlingots makers. 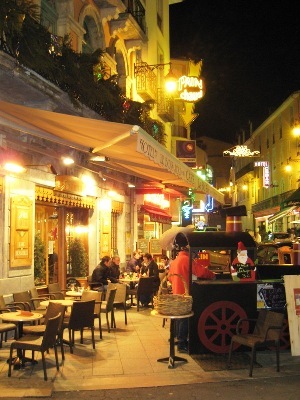 Cauterets is also a family-friendly place for après-ski. There are lots of well-run restaurants that have menus catering to adults and children. If you stay in self-catering apartments there’s a cute market with all the typical fresh French foods, three small supermarkets, bakeries, delis and wine shops. Once you are in the town you can get to everything on foot (including picking up your ski equipment if you rented it). And if you choose Cauterets for a Christmas vacation your children will see Santa coming down from his snowy domain on Christmas Eve in the Cauterets cable car! Toulouse International airport is approximately a 2-hour drive. Ryanair: from London, Stanstead. See www.ryanair.com for timings and prices. The major car hire companies are at Toulouse, Lourdes and Pau airports. Taxis are available from all airports to Cauterets. You will need to book in advance. Taxis can take up to six people with baggage. If you are staying at Mulcares (see below) they will be happy to organize your taxi for you. Paris to Lourdes (duration is about 6 hours). From Lourdes train station there is a regular bus direct to Cauterets (duration one hour) or you can take a taxi.